News from LMCU: Carry a monthly balance? 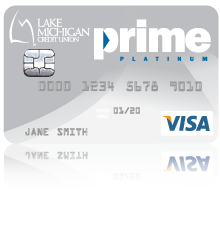 Prime Platinum Visa is your card! Carry a monthly balance? Prime Platinum Visa is your card! If you carry a balance from month to month, Prime Platinum’s low rate (as low as 6.50% APR*) will save you big money over traditional, high-rate credit cards. These days, some credit card rates can be upwards of 20% APR. Not good! Transferring your high interest rate debt to our Prime Platinum card could mean huge savings and is as easy as taking a picture of your statement with a smartphone. Apply today, save tomorrow! Call or visit any branch location or Click here to get started.